Joh is an interesting individual. To meet him in a dark alley on Buck’s Den you would probably drop all of your belongings and beg for him to take them and spare your life. But when you visit his sheck (formerly a tent, but now an abandoned hut) on the mainland side of Skara Brae, you will get nothing but good food, good drink, and a lot of interesting talk. 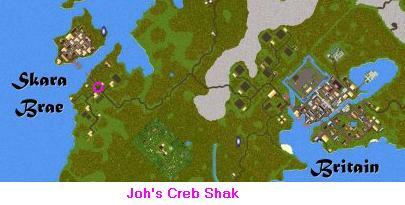 His Creb Sheck serves some of the best fish, ribs, and other food. Joh’s was sponsored with fine dining furniture, and a hut to replace his tent. He has seating for many people, so come on by.